If you are left-handed you are one of the 10% of people that are left-handed in the world. Pretty special right and unique right? Well, not in the world of gaming. Like most other items on the planet, specialist left handed items are hard to come by and sadly that is the case for a left handed gaming mouse. Apparently, 10% is too niche a market for many gaming mice makers to dive into. Frustrating if you are a lefty, you are left with limited left-hand gaming mice options, use ambidextrous mice or forced to use and learn to game with right-handed mice. Sadly to say, if you are wanting a fully fledge left handed gaming mouse the choices are very limited. There are a couple of actual dedicated left handed mice, however if they do not suit, your next best bet is an ambidextrous mouse. In this article, we have listed the dedicated left handed options along with a number of popular and high quality ambidextrous options. It is great to see another one of the major gaming mice makers come to the party and create one of their high-quality products for both left and right-handed gamers. Though this mouse is not a purely dedicated left-handed mouse it certainly caters extremely well for the left-handed gamer. Not only that it comes with the high quality that Logitech is known for. An excellent feature of this particular mouse of which there are many is the fact that it is a wireless capable mouse. No more messing around with cords should you prefer it that way and the wireless connection is more than adequate as the mouse is used by professional gamers, so you know there is little to no lag. You will be able to get up to 30 hours of game time on a single charge which is great for those gaming marathons. If you are looking for a left handed wireless gaming mouse, there really is only a few options. This one is high quality. It uses the high-quality PMW3366 Optical Gaming Sensor which is considered one of the best sensors available today. With a DPIrange of 200-12000, you will have more than enough to suit your needs. As with Logitech’s products, you get their fantastic software and extremely customizable colors and features but probably the best this about this mouse is the fact you are physically able to customize the buttons. So, should you have a right handed player and a left-handed player in your house, you are able to change the buttons on the mouse physically to suit. You could have a left handed, ambidextrous or right-handed setup should you want it. It is good to have options and that is what this mouse offers. Can’t afford the new G900 Spectrum but still want the Logitech quality? You could try the Logitech G300s. This mouse is quite a bit older so you will not get the same specs and latest sensor the G900 has but you can still be assured of the quality. The mouse has overwhelming positives reviews from purchasers on Amazon. The G300 comes with 9 programmable buttons which for the price is a good amount. 3 onboard profiles for saving your gaming setups. The DPI settings can be changed on 5 different levels up to 2500 dpi. The software for the mouse can be downloaded online and the Logitech software is one of the best around. As well as the buttons, profiles, and DPI, you are able to change the report rate, pointer behavior on the X/Y axis along with DPI X/Y levels independently. You can change the color of the lighting on the mouse between 7 different colors. The Profiles can be changed in game. This mouse is on the lighter side of the spectrum and does not come with any weights feature so if you are looking for a heavy mouse this may not be the one for you. The middle mouse button is not tilt-shift. Following on from the above Logitech G900 and its ability to be customized the G.Skill Ripjaws MX780 has a lot of available customizations of its own and this mouse comes at a much lower price tag. Like many other gaming mice in this day and age the MX780 has the ability for the user to change the heaviness of the mouse with an adjustable weights system with 4.5g weights able to be put in and out of the mouse. Unlike many gaming mice, these days this mouse has the ability to be height adjusted with the palm rest being adjustable for the user to adopt a height which best suits their ergonomic needs. As well as the ability to adjust the height the MX780 also has adjustable side grips which mean you can set this mouse up for your preference, working for both left and right-handed gamers. The other specs are not quite up to the same standard as the G900 but at a much cheaper price that is what you would expect. Having said that the mouse is still of a reasonable standard. It comes with an Avago laser sensor which a lot of mice do, Omron micro switch, which many mice do also as well as DPIup to 8200. It has onboard profile storage for easy portability as well as 8 programmable buttons and lighting customization options. If you cannot justify forking out for the G900 but still want to have a good amount of customization with your mouse then the G.Skill Ripjaws MX780 is certainly worth a look, especially given its favorable reviews. If you are looking for the most buttons you can get for your MMORPG then this mouse is the best bet for left-handers. 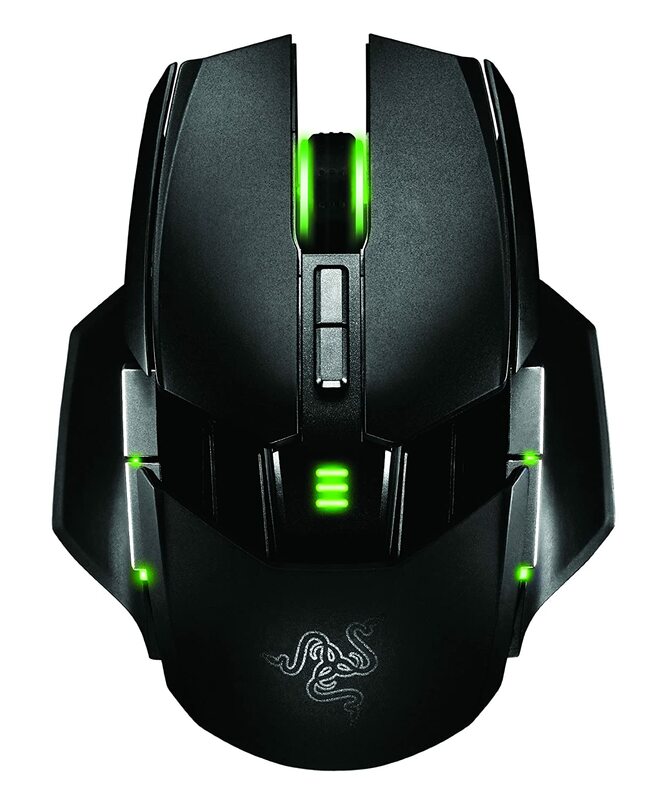 Razer is one of the more well-known gaming hardware makers and known by most gamers. Razer always makes sleek looking products and the left-handed Naga is no exception and it comes packed full of the features the right-handed mouse has. The Razer Naga left handed mmo gaming mouse has the most buttons you can get with left handed mice with the 12 button thumb pad and 19 optimized buttons total. More importantly, though the Razer Naga is ergonomically designed for the left-handed gamer. If you are a WoW-specific player the Naga software is very easy to customize and they have developed a special WoW configurer to make setting up your buttons and macros so much easier. This is a great option as a left handed mmo mouse. Again Razer has come to the party for left-handed gamers with the Razer Deathadder left-hand edition. Although not as high spec-ed as the Naga in terms of buttons and capability the Deathadder seems to have favorable feedback from its users. Although probably more suited to FPS the Deathadder comes only 5 buttons and 3500dpi. With limited choices available for a fully fledge left handed gaming mouse left handed gamers might finding themselves using the next best thing which is an ambidextrous gaming mouse. Again Razor has come to the party providing an elite level gaming mouse in the Razer Ouroboros. The Ouroboros comes with up to 8200dpi and a dedicated DPI clutch-trigger for easy adjustment of the DPI on the fly. Also, or those of you that prefer a wireless gaming experience the Ouroboros can run up to 12 hours with a single AA battery for the wireless experience. The SteelSeries Kana comes with 5 programmable buttons. The SteelSeries Kana ambidextrous gaming mouse, however, comes with good reviews and is amazingly comfortable for all grips. It features aTournament Grade Optical Sensor and you get drag & drop macros with timing control, unlimited number of profiles and a heat map of button use. It’s a popular choice for left-handed gamers looking for a mid range, mid-priced gaming mouse. You will also have the SteelSeries software SteelSeries Enginewhich has a lot of customization options for your gaming. The SteelSeries Sensei is another favorite for left handed gamers. Much like the Ambidextrous Kana, the Sensei isn’t packed with a lot of buttons but comes with a couple more programmable buttons than the Kana with 7 included on the mouse. It features a very user-friendly ergonomic shape, driverless plug & play and a slick look. Mionix have produced a range of gaming mice as well as a couple of ambidextrous gaming mice. The Avior 82000 comes packed with up to 16.8 Million LED color options,128 kb built-in memory, 8200 DPI laser sensor with a whole lot of other features to enhance your gaming experience. It comes with 9 programmable buttons, a few more than a lot of other competitors. The Avior is custom made for claw grip gamers. If you haven’t been searching for a left-handed mouse long you will quickly realize the options for a pure left-handed gaming mouse are few and far between. There are however a whole lot of ambidextrous mice to make up the slack. Although this may not be ideal and generally you are going to miss out on those high-end mice with plenty of buttons. At least there are a number of ambidextrous mice available to choose from with a variety of price ranges.